Les arts et métiers. Avec 24 vignettes par Victor Adam. Fribourg. Paysanne fribourgeoise en costume de la partie allemande du Canton. S.d., vers 1830, - 18 x 11 cm, lithographie aquarellée à la main, papier légèrement bruni, encadrement en bois doré (26 x 19 cm). Please notify before visiting to see a book. Prices are excl. VAT/TVA (only Switzerland) & postage. cf. M.-Th. Daniëls: Fribourg et ses costumes régionaux, 1981. Fig. 34 & 35 (page 90/91); cf. Boschung, Moritz, Sensler Trachten (1993) Abb. 68 (variante avec oiseaux dans la main). BODMER sculps. (nach) ARTER del. Frybourg. Longueur du pont en fil de fer 905 ft.
Zürich chez Henry Fuessli et Cie., vers 1830, - 14 x 20 cm (25.5 x 34 cm), Aquatinte coloriée de Fribourg en Suisse, gravure aux couleurs fraiches, gommée, / kolorierte Aquatinta-Ansicht von Freiburg, 1 feuille. Please notify before visiting to see a book. Prices are excl. VAT/TVA (only Switzerland) & postage. [Ascension, 1830. Chipped along edges; 1 1/2-inch vertical tear in the sky at top-center; 1 1/2-inch horizontal tear in the water at far- right center. Framed and matted. Very good. An attractive watercolor view of a small coastal fort and settlement, probably at Ascension Island in the South Atlantic Ocean. The painting, a bird's-eye perspective facing the sea, shows an austere coastal landscape in reds and browns, with a Union Jack flying from the small fort on a hill near the settlement of one- and two-story buildings. In the foreground a gentleman in a colorful suit stands with a staff or pike, and others survey the scene with a telescope. Near the structures waves crash upon a sandy and rocky shore, and four ships sail in the distance. 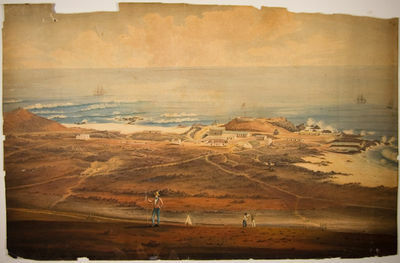 A later ink inscription on the verso of the painting reads, "Ascension," and the scene strongly suggests Ascension Island in the South Atlantic, part of the British dependency of St. Helena, and an important stopping point for ships rounding the Cape of Good Hope throughout the age of sail. Few images of Ascension have survived from this early period. An English and Japanese and Japanese and English vocabulary. Compiled from native works. SADO IKKOKU SAN SUI GA: BIRD'S EYE PANORAMIC MAP OF THE MOUNTAINS AND WATERS OF SADO BANISHMENT ISLAND COUNTRY. A SUPERB WOODCUT MAP OF JAPAN'S "BANISHMENT ISLAND" & GOLD Tokyo 1830, - Egawa Sentaro [carver]. Single sheet woodblock-printed map, 48 x 33.5 cm., very good, two cinnabar collect-or's seals Kurita Genji + another ulnread, surface a bit olddusty, seven small old mended worm holes, else a solid copy. Color scans available for this book on request. 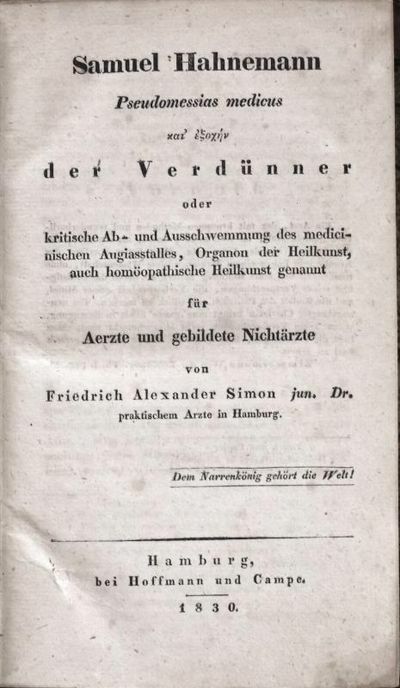 Description content 2015Copyright Rare Oriental Books Co.
Hayne, Friedrich Gottlob u. a.
Darstellung und Beschreibung der Arzneygewächse welche in die Neue Preussische Pharmacopöe aufgenommen sind. Zweiter Bd. Nach natürlichen Familien geordnet u. erläutert von Dr. J.F. Brandt u. Dr. J.T.C. Ratzeburg . Mit LV illuminirten Kupfertafeln. Vue de l?entrée dans la vallée de Chamouni et du Dôme du Gouté. publié par J. P. Lamy à Berne, Bâle, Lausanne et Genève, s.d. vers 1830, - 24 x 21.5 cm (image), aquatinte gouachée, quelques taches d?eau surtout sur les bords. 1 feuille. Passepartout. Belle vue de la vallée couronnée du Mont-Blanc. Le dessin très fin de l?artiste montre une scène rurale en avant-plan: un troupeau de chèvres, une paysanne, un randonneur ou berger avec chien (portrait de l?artiste?). L?éditeur-graveur Johann Peter Lamy était un artiste et marchand d?objets d?art, actif autour de 1800. La plupart des estampes de la région du Mont-Blanc publiées par Lamy sont exécutées d?après des dessins signés simplement ?Grundmann? Un artiste connu pour ses vues du Mont-Blanc, mais à part cela peu documenté. Il s?agit peut-être d?un peintre allemand de Breslau, actif vers 1821(Mont-Blanc, Conquête de l?imaginaire) ou alors d?un peintre italien de Courmayeur.Please notify before visiting to see a book. Prices are excl. VAT/TVA (only Switzerland) & postage. Thieme-Becker 15, 144; Brun: -. [France, 1830. Oblong octavo. Contemporary half black morocco and blue boards, yellow endpapers. Lacks front free endpaper. Very good. John Abbot was one of the most important American natural history artists and his illustrations are amongst the finest ever made. Born in London in 1751, Abbot sailed for Virginia in July 1773, with orders for both actual specimens and drawings of the local insects. For the next two years he continued to collect and paint, sending home three insect collections, although only one arrived safely. The loss of these two valuable collections at sea together with the worry over political unrest in Virginia led Abbot to move to Georgia. He settled in St. George Parish (later Burke County), Georgia in December 1775. Abbot traveled widely throughout Georgia devoting his time to the study of the natural flora and fauna. The flow of specimen collections and watercolors of insects ensured that his name became known to many of the foremost natural scientists and collectors of the day, both in America and Europe. Abbot&#39;s NATURAL HISTORY OF THE RARER LEPIDOPTEROUS INSECTS OF GEORGIA was first published in London in 1797. The present French manuscript includes forty watercolors based on the plates from that edition. The images comprise fifty-three depictions of butterflies and moths on the forty sheets, with eleven of the images including depictions of the lepidoptera in caterpillar form and several with depictions of flora and/or chrysalis. Each image is captioned in French above or below the image and numbered 1to 40 in the upper right corner; the alphabetical index corresponds to each watercolor ensuring that no images have been removed from the album. Between 1829 and 1837 interest in Abbot in France was greatly elevated due to the publication of a new work based on Abbot watercolors commissioned by lepidopterists Jean Baptiste Boisduval and John Eatton LeConte. It would seem possible that this album was related in some way to lepidopterist Jean Baptiste Boisduval. Souvenirblatt. "Rheinsberg und seine Umgebungen". Wiesbaden-Biebrich. - Schlossansicht. - "Vue du château de Biberich Résidance de S A. S. le grand duc de Nassau". - Historische Ortsansicht. Aquatinta, koloriert, um 1830. Von Friedrich Salathé, nach Egidius Federle. 19 x 28 cm (Darstellung) / 28,6 x 37,3 cm (Blatt). Rechts oberhalb der Darstellung nummeriert "No. 50". Unterhalb der Darstellung links "Desiné par Federke", rechts "Gravé par Salathé". Darunter mittig betitelt. Unten links "Publié par Ls. Bleuler à Schaffhouse en Suisse". - Malerische Ansicht des Rheins mit dem barocken Biebricher Schloss und Blick auf die Stadt. - Blatt minimal angeschmutzt. Rückseitig Reste vormaliger Montierung. Insgesamt gut erhaltenes Exemplar. Friedrich Salathé (1793 Binningen - 1858 Paris) schweizer Graphiker, Landschafts- und Architekturmaler. Schüler von Peter Birmann. 1815/21 Aufenthalte in Rom und Neapel. 1821/23 Vedutenstecher in Basel für Falkeisen & Huber. Seit 1823 Arbeit als Aquatintastecher in Paris. Weiterhin als Zeichner und Maler tätig. 1834, 1836 und 1848 in den Ausstellungen schweizer Kunst in Bern vertreten. 1841 mit zwei Aquatinten im Pariser Salon. Egidius Federle (1810 Stühlingen - 1876 Freiburg i. B.) deutscher Landschaftsmaler. Schüler Heinrich Uster's in Feuerthalen. Tätig u. a. im Schloss Laufen, in Schaffhausen und Konstanz. Ließ sich anschließend in Freiburg nieder und war 1848, 1856 und 1858 auf der schweizerischen Turnusausstellung vertreten. Blick von der Nahemündung auf den Hafen; rechts im Hgr. die Rochuskapelle; links Rüdesheim, Geisenheim u. der Johannisberg ('Vue de Rudesheim Et Du Joanisberg Prise De Bingen'). Wien Trentsensky vor 1830 - Federlithografie von J. Trentsensky nach J. Kuwasseg, Bildausschnitt 40,5 x 53 cm, Blattgr. 46 x 57 cm. Paulusch, Ikonographie Österreichs, W 5665, zu Josef Kuwaseg (auch Kuwassegg, Kuwasegk) siehe ÖBL 4/378; am 25.11.1799 in Triest geboren und am 19.03.1859 in Graz gestorben, zwischen 1826 und 1830 war er für den Verlag von J. Trentsensky tätig, demnach wird das Blatt in dieser Zeit entstanden sein; prachtvolle Ansicht der Stadt Wien von Süden mit der Spinnerin am Kreuz am linken Bildrand, eine der beliebtesten Ansichten der Stadt; hier wird im Vergleich zu anderen fast gleiche Ansichten (zum Beispiel Schlotterbeck nach J. Fischer) die Stadt nicht so weit in den Hintergrund gerückt sondern ist als detailreiches Panorama hinter der stark befahrenen (heutigen Triester)-Straße gut sichtbar; etwas fleckig, ein Einriss im linken Bildrand bis in die Darstellung reichend alt hinterlegt, sonst in sehr gutem Zustand. Mont-Blanc. - Vue de l?Entrée dans la Vallee de Chamouni. Publié pr. J.P. Lamy à Basle, Berne & Genève, s.d., vers 1830, - 12x16 cm., (16.8x20.5), gravure aquarellée en bleu et noir / Kolorierte Aquatinta, guachiertem Blattrand, pt. tampon au verso d?un collectionneur ?ABZ dans triangle?, Magnifique vue, d?une grande finesse, les gravures tirées en bleu sont rare.Please notify before visiting to see a book. Prices are excl. VAT/TVA (only Switzerland) & postage. Mont-Blanc. - Vue du Montblanc prise près de Sallenches. Publié pr. J.P. Lamy à Basle, Berne & Genève, s.d., vers 1830, - 12x16 cm. 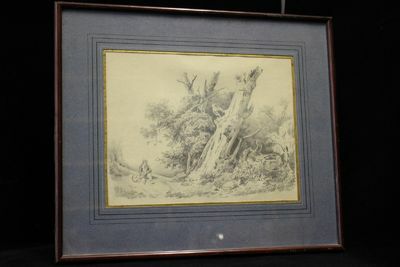 (16.8x20.5) gravure aquarellée en bleu et noir / Kolorierte Aquatinta, guachiertem Blattrand, pt. tampon au verso d?un collectionneur ?ABZ dans triangle?, Magnifique vue d?une grande finesse, les gravures tirées en bleu sont normalement coloriées par après.Please notify before visiting to see a book. Prices are excl. VAT/TVA (only Switzerland) & postage. Aargau Bauernhaus, Argovie, Maison paysanne. Bâle, Birmann & Huber, s.d., vers 1830, - 20 x 27.5 cm, aquatinte originale, coloriée à la main, encadrement en bois doré (35 x 41 cm). Please notify before visiting to see a book. Prices are excl. VAT/TVA (only Switzerland) & postage. Souvenir de Berne et ses environs. L?Oberland, Pont à Fribourg, etc. Collection des habitations rurales dans les XXII Cantons de la Suisse dessinées d'après nature par Frey, Fussli, Meyer, Schmid et Weibel. Zurich, Keller & Fussli, marchands d'estampes et de fournitures pour le dessin, s.d. (vers 1830), - in-8vo, oblong, 2 ff. + 21 (sur 24) planches gravées à l'aquatinte (non mises en couleur), rousseurs marginales, tache d?humidité au coin inf. des dernières ff., reliure en plein cuir orange légèrement usée, dos avec petit manque de cuir. 1) Maison de païsan au Canton de Zurich / 2) Maison de païsan au Canton de Berne à Munsingue / 3) Maison de païsan au Canton de Lucerne / 4) Maison de païsan au Canton d?Uri / 5) Maison de païsan au Canton de Schwyz / 6) Maison de païsan au Canton d?Unterwalden / 7) Maison de païsan au Canton de Glarus à Nestall / 8) Maison de païsan au Canton de Zoug / 9) Maison de païsan au Canton de Frybourg à Ubersdorf / 10) Maison de païsan au Canton de Schaffhouse à Hallau / 11) Maison de païsan au Canton d?Appenzell, le Weissbaad / 12) Maison de païsan au Canton de St. Gall à Muls sur le lac de Wallenstadt / 13) Maison de païsan au Canton de Grisons à Fideris / 14) Maison de païsan au Canton de Thurgovie près Mammern / 15) Maison de païsan au Canton du Tessin, Auberge de Poleggio / 16) Maison de païsan au Canton de Vaud, près de Lucens / 17) Maison de païsan au Canton de Valais près Lax vers le glacier de Viesch / 18) Maison de païsan au Canton de Neuchâtel à Motiers (demeure de J. J. Rousseau) / 19) Maison de païsan au Canton de Genève à Versoix / 20) L'intérieur d'une cabane Suisse / 21) Chalet sur les Alpes de l'Oberland Bernois.Manquent: Bâle, Soleure, Argovie.Please notify before visiting to see a book. Prices are excl. VAT/TVA (only Switzerland) & postage. Lonchamp L?Estampe et livres à gravures n° 126; Lonchamp sous Collection N° 677 (ex. colorié). Souvenirs de la Suisse. Canton de Berne. TEGERNSEE. Blick von Süden über den See zum Kloster, links im Mittelgrund der Ort; auf dem See großes Ruderboot mit Jagdgesellschaft. - Lithographie mit Tonplatte von Lebschée, 1830, 15 x 21 cm. Gesamtans., vom Kammerforster Weg aus. ANCONA. "Prospetto della Citta di Ancona". Gesamtansicht vom Meer aus mit zahlreichen Schiffen, umgeben von 14 Teilansichten. - Lithographie von D. Luigi bei G. Grassini, um 1830, 52 x 72 cm. Die Teilansichten zeigen u.a. Piazza Nuova, Piazza Maggiore, Theater, Kathedrale, Arco Clementino und Trajano, Loggia de Mercanti sowie verschiedene Kirchen. Imposant ist die große Gesamtansicht mit Titel und Wappen im Himmel. - Seltenes, kapitales Souvenirblatt in guter Erhaltung. ROM. - Petersplatz. Prächtiger Blick über den Petersplatz auf den Petersdom, die Kolonnaden und den Vatikan, mit reicher Personenstaffage. - Gouachierte Lithographie mit Tomplatte, um 1830, 25 x 37 cm. In der Art eines Guckkastenblattes gestaltet, mit sehr reicher Personenstaffage. - Mit getuschter schwarzer Umrahmung. BUNSEI KAISEI OEDO OEZU: GREAT MAP OF EDO IN BUNSEI. BUNSEI KAISEI OEDO OEZU: GREAT MAP OF EDO IN THE BUNSEI TO KAISEI PERIODS, 1830. A LARGE FOLDING WOODBLOCK PRINTED MAP SHOWING EDO [TOKYO] Edo 1830, - Suharaya Mohie. Blue stiff paper covers, black andwhite, printed, some folds tender, minor old worming, 1.6meters x 87.5 cm., distance chart, key to famous places andcities, directional symbols, folds down to 16 x 23.4 cm. Color scans available for this book on request. Description content 2015Copyright Rare Oriental Books Co.
Hummel, Nepomuk Johann, Komponist und Pianist (1778-1837). Eigenh. Brief mit U. ("JHummel"). O. O., 5. IV. 1830. - 1 S. auf Doppelblatt. 8vo. Mit eh. Adresse. An den italienischen Tenor Marco Bordogni über die Möglichkeit an einer kommenden Produktion mitzuwirken. - Etwas fleckig und mit kleinen Randläsuren; Provenienz: Aus einer Chicagoer Privatsammlung. Paris: Marcilly, 1830. Marcilly. 95pp. Oblong. A miniature collection of La Fontaine's fables illustrated with six finely-engraved plates and an engraved title-page vignette. This copy is in a deluxe binding contemporary to the book. Wear to head and tail of spine, stain to one text page, and 8mm closed tear to another text leaf, else a very good copy in green calf decorated in gilt and blind. A.e.g. (Welsh 4236; Spielmann 290A; see Gumuchian 3573, Plate 160). (1 3/8 by 2 3/16; 35x55mm). Theater-Bilderbuch. Vier Scenen für das Kinderherz mit ganz neuen Decorationen und Text in Versen. Esslingen, J. F. Schreiber, (ca. 1882). 2. Auflage. 4°. (6) Bl. Mit 4 chromolithographierten aufklappbaren Kulissenbildern. Illustrierter Orig.-Halbleinenband. - Enthält die 4 Theaterbilder "Das Rotkäppchen", "Hansel und Gretel", "Die Weisen aus dem Morgenland" und "Der Weihnachtsabend". Der Jurist u. Schriftsteller Franz Bonn (1830-1894) publizierte auch unter dem Pseudonym "Von Miris" publizierte u. lieferte zahlreiche Texte zu den "Meggendorfern". Einband etwas bestoßen und berieben, Deckelillustratien mit geringem Verlust, innen kleine Einrissstellen fachgerecht restauriert. Insgesamt erfreulicher Zustand. 1500 gr. 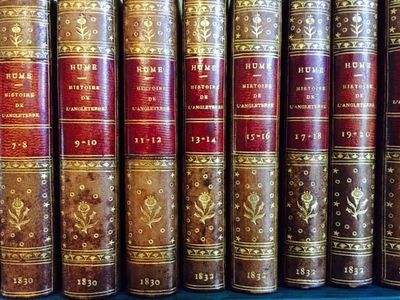 Hamburg, Hoffmann und Campe 1830.. VIII, 303 S. HLdr. d. Zt. Engelmann 542; Lesky 613; Waller 14962. - Erste Ausgabe, es erschienen noch 3 Fortsetzungen. - "Eine sachliche Klärung wird niemand in diesen Schriften erwarten, immerhin sind sie gerade wegen ihrer Schärfe und der marktschreierischen Titel bekannt geworden und gewiß nicht ohne Einfluß auf die Stimmung der schulmedizinischen Ärzte gewesen … Es konnte nicht ausbleiben, daß durch solche Arbeiten die Luft auf dem Kampffeld völlig vergiftet wurde" (Tischner 458). - Friedrich Alexander Simon (1793-1869) war einer der bekanntesten und einflussreichsten Kritiker Hahnemanns. Hirsch-H. V, 276 nennt ihn gar "der productivste und kampflustigste Syphilograph aller Zeiten und Völker". - Der Titel mit dem Motto: "Dem Narrenkönig gehört die Welt!". - Etwas berieben, tls. braunfleckig. TEGERNSEE. Schloss Tegernsee mit königlichen Equipagen. - Aquarell in Braun über Bleistift von Franz Xaver Nachtmann, um 1830, 22,5 x 28,5 cm. Vorzeichnung für die Lithographie "Schloss Tegernsee", die bei Th. Kammerer in München mit einem zusätzlichen Rahmen in Gold gedruckt wurde (siehe die folgende Nummer). Zur Übertragung auf den lithographischen Stein rückseitig mit Bleistift geschwärzt. - Der Maler an der Nymphenburger Porzellanmanufaktur, Franz Xaver Heinzmann (1799 - 1846), schuf zahlreiche Aquarelle vom Tegernsee, sowie Interieur-Bilder vom Tegernseer Schloss im Auftrag der Wittelsbacher. Seine minuziösen Darstellungen von Architektur und Staffage erfreuten sich größter Wertschätzung und gehören heute zu den gesuchten Kostbarkeiten des Marktes. - Mit schwarzer Einfassungslinie. In ein Albumblatt eingesetzt; unten handschriftlich bez. "Tegernsee". In makelloser Erhaltung. Paris: A. Hocquart Jeune, Editeur / P.-H. Krabbe, Editeur 1830 / 1834. 40 volumes bound as 20. 9cm x 14cm. Contemporary brown full leather. Decorative gilt to spines with maroon leather title labels. Marbled endpapers. All edges red. Ribbon markers. Bound by Relieur Bazas. Occasional minor marks to boards. Scattered light foxing. Frontis portrait engraving. Additional engravings, some folding. Text in French. Gilt spines bright. A fresh and handsome VG to Near Fine set. . Very Good. Full Leather. 1830. 32mo..
Justinian / Otto, Carl Ed. [Eduard]; Schilling, Bruno; Sintenis, Carl Friedrich Ferdinand (Hsg./Red.) et al. Das Corpus Juris Civilis, in's Deutsche übersetzt von einem Vereine Rechtsgelehrter und herausgegeben von Dr. Carl Ed. Otto, Dr. Bruno Schilling, Professoren der Rechte an der Universität Leipzig, und Dr. Carl Friedrich Ferdinand Sintenis, als Redactoren. [Band I?IV: Pandekten od. Digesten; V?VI: Codex; VII: Novellen, Edikte, Constitutionen]. London: Henry Colburn and Richard Bentley, New Burlington Street,. 1830. nineteenth-century three-quarter black leather and marbled boards, spine panels richly tooled in gold, brown leather title pieces.. Some rubbing to edges, a bit of scattered foxing to text block, a. very good copy. Scarce in the trade; no copy at public auction since. 1977 (Swann Galleries, hammer $90). (#137376). First edition. The first anthology of American short fiction (excluding single author collections and literary annuals and gift books). Twenty- seven stories with American settings, anonymously contributed by many of the leading American short story writers of the period before the rise of Hawthorne and Poe, including James Hall, Catharine Maria Sedgwick, Godfrey Wallace, James Kirke Paulding, William Leete Stone and Nathaniel Parker Willis. There are also stories by John Neal, Gulian C. Verplanck, and William Cullen Bryant. Supernatural tales include "Pete Featherton," a supernatural tale by Hall, "The Ghost," a nautical ghost story by Paulding and "The Rife," a tale about an enchanted gun by Leggett. Miss Mitford, a popular writer of British regional fiction (OUR VILLAGE, 1824-1832), considered American "lighter" fiction to be superior to anything of the kind in Great Britain, and compiled this collection of American tales (largely selected from American periodicals and gift books) for the edification of her countrymen. 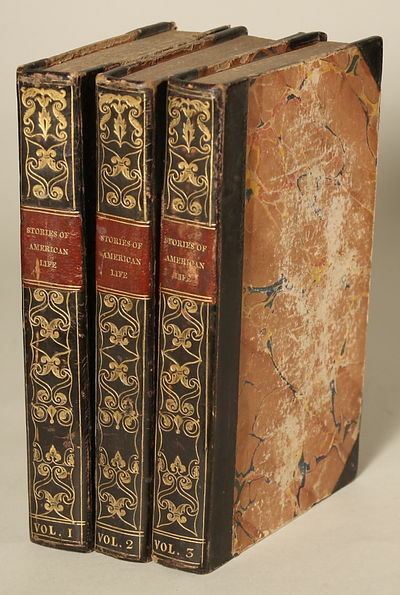 A second three-volume collection of fiction by American writers, LIGHTS AND SHADOWS OF AMERICAN LIFE, was compiled by Miss Mitford and published in 1832. "The story of Mitford's conversion from abhorrence to energetic endorsement of many American writers now regarded as among our best deserves a place in the history of the literary relationship of England and America ..." - John L. Idol, Jr., "Mary Russell Mitford: Champion of American Literature," Studies in the American Renaissance (1983), p. 313. HAMBURG. "Ansicht von Hamburg". Gesamtansicht vom Hafen aus mit Michaelis- und Nikolaikirche, umgeben von 16 Teilansichten. - Lithographie, anonym, um 1830, 33 x 46 cm. Die hübschen Ansichten zeigen die wichtigsten Kirchen, Dammtorstrasse, Badhaus an der Alster, Wilheminenbad, Stintfang, Jungfernstieg, Mariannenruh u.a. - Kleine Randeinrisse sorgfältig hinterlegt, sonst sauber und frisch. Seltenes und frühes Souvenirblatt! Philadelphia, 1830. 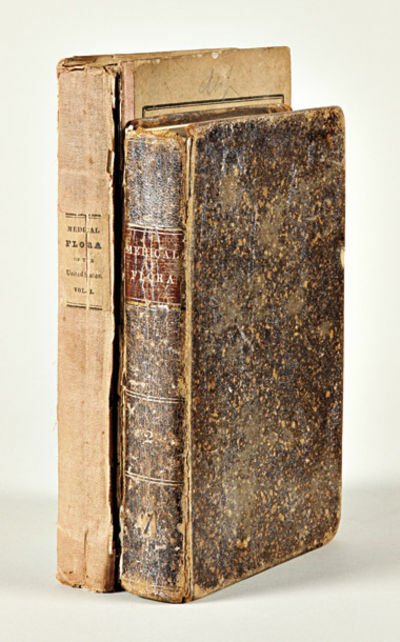 First volume: Original cloth-backed printed paper boards, paper label. Front board nearly detached, boards rubbed and stained. Institutional ink stamp on titlepage. Lightly tanned, else quite clean internally. Good plus. Untrimmed. 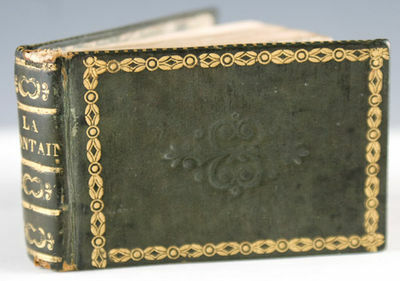 Second volume: Contemporary spotted calf, gilt leather label. Early ownership signature on front free endpaper. Tanning and foxing. Good. In individual cloth chemises and slipcases, leather labels. The most important work of the eccentric polymath naturalist, Rafinesque, based on his fifteen years' experience collecting American medicinal plants. Rafinesque visited the United States in 1802-4, returning as a permanent resident in 1815. He travelled extensively in the eastern and midwestern United States, and was professor of natural history at the University of Kentucky in the early 1820s, making a significant contribution to American botany. This book, self- published in an individual style, as with many of his productions, contains cataloguing of hundreds of American medicinal plants. It is illustrated by 100 plates printed entirely in green. This is Rafinesque's most extensive work, as well as being one of his most important contributions. As with all of his works, it is quite rare. Souvenirs de la Suisse. 100 vues les plus remarquables et 48 costumes des XXII cantons. SALZBURG. "Die Festung Hohen- Salzburg u. der Nonnberg, vom Rosenegger- Garten aus gesehen". Schöne Gesamtansicht. - Kol. Lithographie von Hellmuth nach E. Adam bei Hermann, um 1830, 20 x 28 cm. Nebehay-Wagner 2,10. - Aus: "Album der Stadt Salzburg". - Breitrandig und gut erhalten, hübsch koloriert. Aufwendig gerahmt. Raimund, Ferdinand, Dichter und Schauspieler (1790-1836). Souvenirs pittoresques de Genève, Chamounie, Pont à Fribourg, Aarbourg et une partie du Canton de Berne etc. Nodet dis. & Le Beau inc.
Alte Markt ('Der alte Markt in Emmerich'). De luitenant generaal Baron Krayenhoff voor het Hoog Militair Geregtshof beschreven en vrijgesproken. Nijmegen, Vieweg 1830 - Several parts in one volume. Octavo. Pp. 52, 24, 24, 156, 11. Hardcover, bound in contemporary cloth and marbled boards, old shelf ticket to spine, old military institutional stamps to half-title and title-page. In a very good condition. ~ First edition. Very rare. Cornelis Rudolf Theodorus Krayenhoff (1758-1840). Brilliant military engineer, Krayenhoff was charged in 1826 with irregularities in the financial management of large scale fortification projects and with carelessness in the exercise of his duties. Charges were pressed against him and eight other officers. A Major General took his life in prison; other officers were sent to prison for periods varying from 6 months to 20 years. Some, including Krayenhoff, were acquitted though he still had to spend two months in prison because of other charges. In 1830 he was formally acquitted of all charges by the High Military Court. At the same year he published the present memoire. S.l. : S.n., 1830. Fine. S.n., S.l. circa 1830, Cadre : 41x35cm ; dessin : 27x20,5cm, une feuille sous marie-louise encadrée. - Unsigned pencil drawing, representing a large dead tree with his foot a drowsy man and his dog. Wooden end frame having a few scratches. - [FRENCH VERSION FOLLOWS] Dessin au crayon non signé, représentant un grand arbre mort avec à son pied un homme assoupi et son chien. Cadre fin en bois présentant quelques griffures. Élève de Jean-Victor Bertin, Jules Coignet adopta la prédilection de son maître pour la peinture paysagiste. Il est l'auteur d'un grand nombre de toiles représentant des vues et des paysages peints au cours de ses nombreux voyages dans le Tyrol et le pays de Bade, en Suisse, en Italie et en Sicile, en Égypte et au Liban en Orient, ainsi que dans plusieurs provinces de France, notamment la Bretagne et la vallée de l'Isère. Published by John Snow, Ca late 1830s, London: - Very rare separately published image of the bread fruit, probably one of the few fruits in history to figure in a mutiny. William Bligh's mishandling of his crew, who were sent to Tahiti to secure the breadfruit to feed slaves in the West Indies in the 1790s, lead to the infamous Mutiny of the Bounty. John Williams traveled for the London Missionary Society in 1816 and brought back a bread fruit when he returned to England in 1834. This image derives from the William's period.Large colored lithograph, with the leaf and fruit occupying most of the image. Many rubbed spots with number of small tears, and one 9" closed tear into sheet. Backed on tissue paper to strengthen cracks. Some lighter discoloration on the right edge. Printed area 39.5 X 50.5 cms. Trove Libraries Australia ID 9131025, at the National Library of Australia.